We start working on the red drapery. The initial idea was to create the drapery in a dense black color. That’s why pure unthinned Mars Black was applied. After the black layer has dried, I decided that that black colour should be changed to a red one. That is why the Underpainting for the successive layers of red Glazes should be prepared. We take Titanium White. As a Medium, we use Stand Linseed Oil well-diluted in Turpentine. We need to establish a new design for our drapery folds. For this, we make separate preparatory sketches. Paint is applied thicker in highlights and spread thinly in midtones. After we have applied this first layer of the Underpainting, the canvas can be placed aside to dry or work can be continued on other parts of the composition. When the surface is well-dried, we continue with glazing. Pure Scarlet Lake thinned with Stand Linseed Oil is used for this Glaze. We spread the Glaze all over the lighted and shaded areas of the garment with a soft brush. When the Glaze layer is applied in a thin coat, we can see that in the shaded areas, the opacity of the coat can be increased. For this, we take pure paint with little or no Medium. We cover the shaded areas in a thicker coat. Let’s increase the thickness of the Glaze over the lighted areas as well. And now, while the Glaze is still wet, we integrate highlights. For this task, we use pure unthinned Titanium White and gently apply it over a viscous red Glaze. Applying more pressure on our brush, white paint can be partially intermixed with the red Glaze. The lighter pressure is, the less blended two colors become. In such a way, we apply brushstrokes in a quite loose and free manner. After that, we leave the canvas to dry. This is the last layer of Glaze. We can choose either Scarlet Lake, which we used initially, or any other bright Red color, providing that the paint is transparent. Of course, the Glaze should be thinned with a Medium, for example with Stand Linseed Oil. It looks like we have completed the task as wanted. Now, when all colors are in place, it becomes apparent that the white part of the dress can be painted in color. So, I have decided to add a transparent glaze of Burnt Umber. We mix the paint with Stand Linseed Oil. Just to remind you – before applying a new layer of paint, the surface should be well dried. The color of Glaze provides an interesting effect. We apply the Glaze in a less-diluted state in deep shadows; while in lighter areas, the paint is spread thinly. 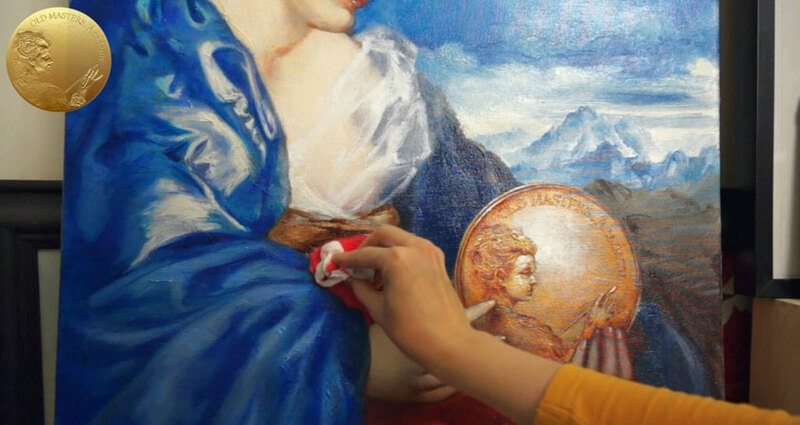 In highlights, you can remove the paint with a piece of tissue. However, this brownish glaze competes with the colors of the medallion. So, I easily removed the paint and changed it to another one. Because the white paint underneath the Glaze is well dried, we can wipe the paint off without removing the lower layers. I feel that the painting will benefit from brighter colors. For now, we can leave the belt as is, and amend only this part of the dress. For this purpose, a very bright Scarlet Lake is used. Any other bright red would be a good choice as well. This paint can be applied undiluted. 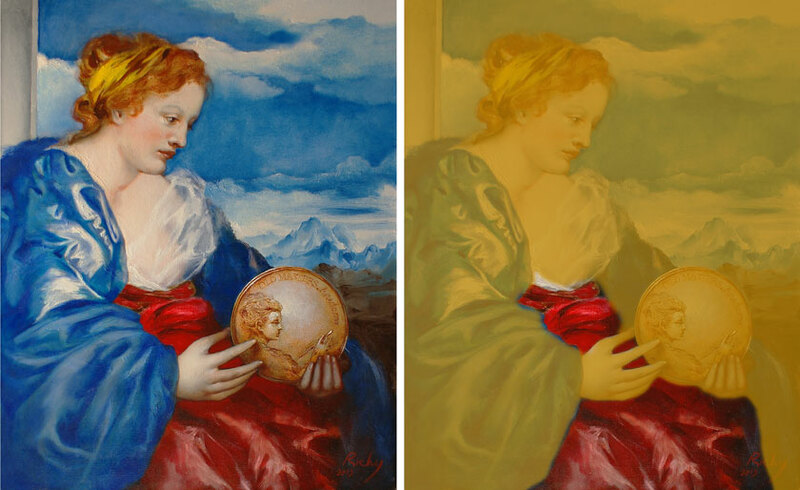 If you think that the intensity of the color should be decreased, just wipe out the extra thickness of the paint. We also touch the red dress in shaded areas under the medallion. At the very end, the deep folds are indicated with Burnt Umber. 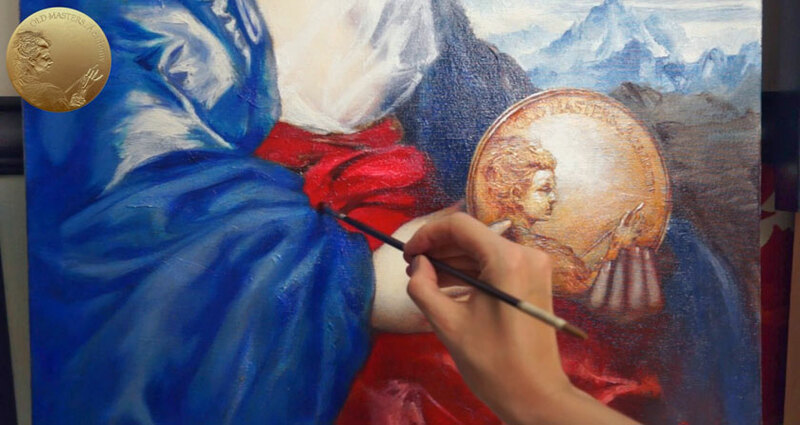 This part of the dress is completed in a direct painting method; however, because the Underpainting is done in dense coats of white paint, it also creates an effect of the light coming from inside the painting. Most of the artwork is painted in Glazings, which creates an optical mixing of colors. And some places are depicted using the Scumbling method. These different painting methods create an interesting combination of textures.